We're delighted to welcome two Cambridge artists, Jennifer Talbot and Stella McHugh to the gallery for the first time during the Open Studios season. 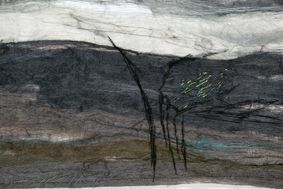 Jennifer Talbot uses a variety of fibres, mixed media and found objects to create work that records experience of the landscapes and archaeology of British islands. In 2005 she was a resident artist in the Shetland Islands and since that time her work has been almost exclusively focused on Shetland. Memory and the importance of place are recurring themes in her current work, the Shetland landscapes, archaeology, walking, photography and drawing are fundamental to her practice. Stella McHugh studied Fine Arts at Manchester and Gloucestershire colleges of Arts. She spent 6 years in Hong Kong as a full time lecturer in design at the HK polytechnic. Whilst there she worked extensively in the fashion industry, and most enjoyably designed ballet costumes for both the HK modern dance theatre and visiting American ballet companies. Returning to England Stella continued her fashion career and retired in 2012. She now concentrates on her greatest love; art.